At the Goldschmidt geoscience conference in Sacramento, California, last month, Shiue-lin Li of Nealson’s lab presented results of experiments growing electricity breathers in sediment collected from Santa Catalina harbor in California. Yamini Jangir, also from the University of Southern California, presented separate experiments which grew electricity breathers collected from a well in Death Valley in the Mojave Desert in California. Over at the University of Minnesota in St Paul, Daniel Bond and his colleagues have published experiments showing that they could grow a type of bacteria that harvested electrons from an iron electrode. That research, says Jangir’s supervisor Moh El-Naggar, may be the most convincing example we have so far of electricity eaters grown on a supply of electrons with no added food. 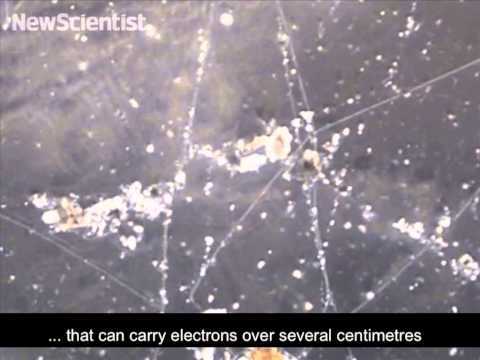 Lars Peter Nielsen and his colleagues at Aarhus University in Denmark have found that tens of thousands of electric bacteria can join together to form daisy chains that carry electrons over several centimeters – a huge distance for a bacterium only 3 or 4 micrometers long. It means that bacteria living in, say, seabed mud where no oxygen penetrates, can access oxygen dissolved in the seawater simply by holding hands with their friends.